Our studio was created in 1976 by us: Lydia Ilarionova and Marin Marinov. Since then we have live and work together as partners in our company, ILADESIGN. We are graduates of the School of Fine and Applied Arts in Sofia, Bulgaria with majors in jewelry design and metal art. Marin had training in restoration techniques at the Institute of Archaeology in Milan, Italy. 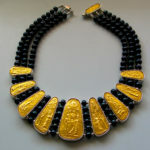 He has mastered many ancient techniques in his work as a goldsmith and worked on the restoration and conservation of ancient treasures for the National Institute for Cultural Heritage in Sofia, Bulgaria. 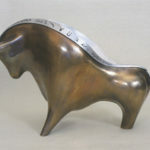 Lydia obtained a Bachelors of Fine Arts and Design from Concordia University in Montreal which complimented her knowledge of symbols and signs from ancient cultures and resulted in the creation of award winning sculptures and art jewelry. Over the years we followed different paths of expression with one thing in common – our interest in the rich cultural heritage of Bulgaria and our passion for ancient art. Our work is recognized for its originality and gained awards and honourable mentions in numerous exhibitions. Lydia Ilarionova and Marin Marinov are artists with wide range of interests with one thing in common – their passion for ancient art and culture. They have been part of various exhibitions, for more please see RESUME Some of their works are shown in their PORTFOLIO. It was first introduced at the Philadelphia Buyers Market, Philadelphia, N.Y.,USA in 1998. It is inspired by images from 5 century b.c. Thracian Scythian, Celtic, Roman and Greek art and made in the ancient technique or repoussee. It consist of jewellery made in pure gold 24kt, sterling silver and semiprecious stones. 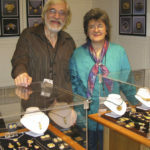 For more information please, visit ABOUT THE ANCIENT GOLD and to order please read our SHOP POLICIES. Our studio creates and makes unique art jewelry pieces. Every piece is handcrafted from pure gold, sterling silver and semi precious stones and stamped for purity and authenticity. The quality of the materials used is guaranteed. We work with Canadian gold, silver and fairly traded gem stones. We also do commission work or customize our existent creations by request with designs provided by customers. To inquire, please provide sketch or description on the desired piece and we will give you an estimate. For more information, visit Commissions or Contact us with your questions or call Lydia at 514 903 8348.